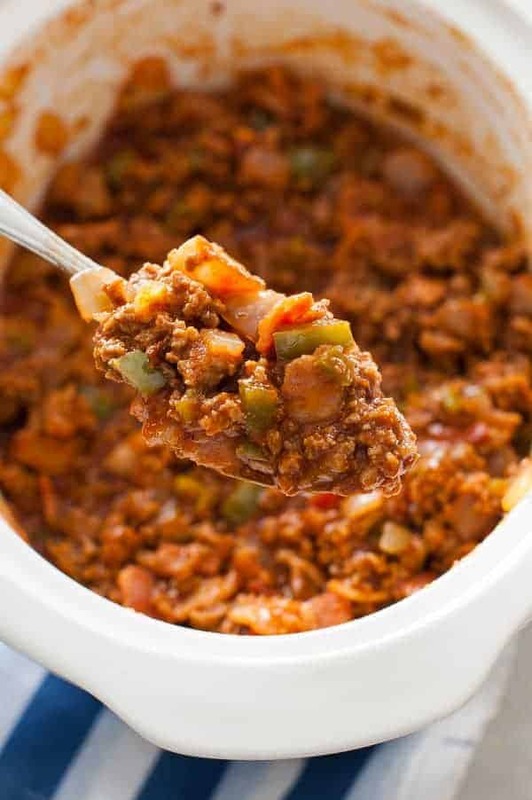 This is a really good crock pot Paleo sloppy joes recipe which is made from scratch without the high fructose corn sugar and other nasty ingredients. These Paleo Sloppy Joes were SO good. How can they not be? I mean, they have BACON! I was really surprised by how much the whole family loved these Paleo Sloppy Joes. We only had half a serving left and I devoured it for lunch. Leftover filling was so good served on top of the sweet potatoes for lunch. I really like the contrast of the strong flavor of the Paleo BBQ Sauce with the plain Paleo Hamburger Buns. 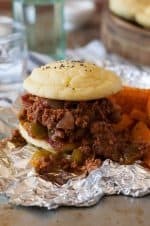 One of the nice things about these Paleo sloppy joes and that I’ve served them lots of times to my family that thinks I’m weird for eating Paleo and they could care less they are Paleo. Basically, they are just homemade and they are way better than the sloppy joes I grew up eating that sauce my mom made from a packet. I hated those. I’m actually kind of surprised that I even attempted to make homemade sloppy joes, but my daughter had them at a friend’s house one night and loved them, so I thought I would give it a try. Boy! I’m glad I did. These are a staple now at our house. I’m often too lazy to make the Paleo hamburger buns, so I’ll just eat it out of the bowl plain with veggies or on a baked sweet potato and let my children use some whole wheat bread to eat with them. Or I serve them at a family party with “real” hamburger buns. The homemade sauce tastes so much better than the canned stuff and it’s easy to make. I like to blend up the onion and pepper so my kids don’t know they are in there, but you still get the flavor from them. 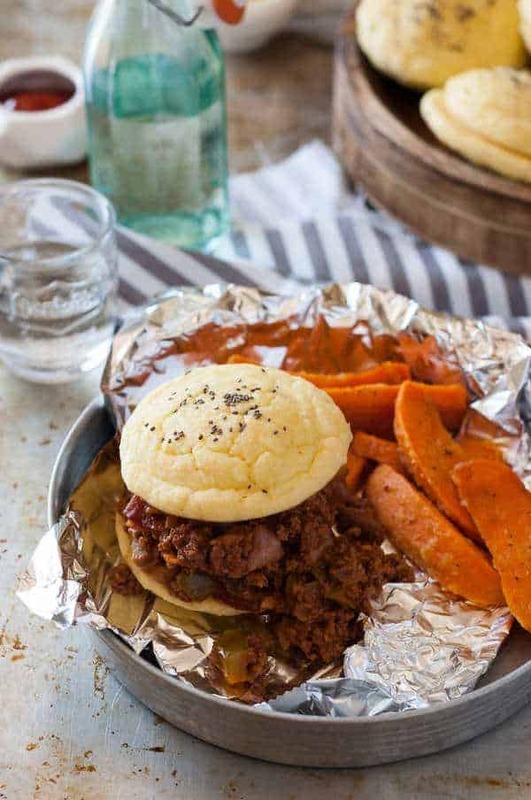 This took a little bit longer to make all of the different parts but it was nice because I already the sauce made and the buns don’t have to cook very long.I served the Paleo sloppy joes with roasted sweet potato fries. 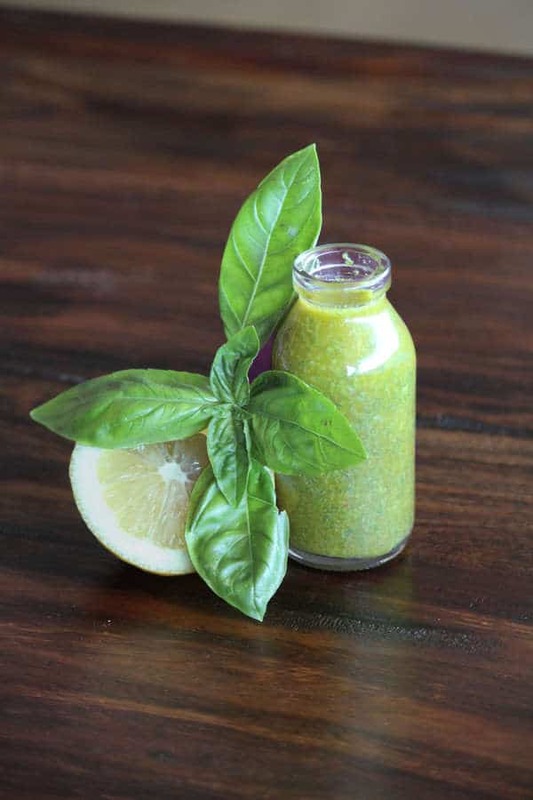 This is a great recipe for the summer time! It doesn’t get better than a “gooey messy burger”. The sweet potato fries were great. I also might eat our zucchini chips with this recipe or a simple fruit or vegetable on the side to supplement the sloppy joe. This homemade sloppy joe sauce tastes so much better than the canned stuff and it’s easy to make. I like to blend up the onion and pepper so my kids don’t know they are in there, but you still get the flavor from them. In a large skillet, brown and crumble the ground beef. Add the beef to a slow cooker. Add the diced bacon to the same pan the beef was cooked in(no need to wash) and cook until it is just starting to brown. Add the onion and green pepper to the bacon and saute until the bacon is fully cooked, and the onion and pepper are soft and translucent. Add the bacon, onion, and pepper to the slow cooker. Add the Paleo BBQ sauce ingredients to the slow cooker, stir well, and heat on low for 2 hours. Serve on My Paleo Hamburger Buns Recipe. Bacon and ground beef? Sloppy Joes? YUM! I used turkey bacon and turkey meat instead. This was amazing and easy to do. My fiancé even loved it. We used tortilla instead of bread. Amazing. This is going to be a big hit at my next work pot luck. 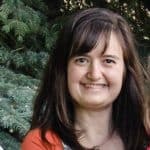 Hi, I’m looking to do some make ahead meals. Have you tried freezing this? i would imagine it would be fine. I haven’t, but I would think it would be fine too. Please let me know if you try so other readers will know how it turned out. I made these tonight and they were awesome. Does anyone know the fat, fiber, protein, and carbs info for this recipe for weight watchers?? I am sorry we don’t provide the information for our recipes at this time. Do yo have a recipe for the paleo buns you could share? I’d love to try these!! I must have missed the link when I look at it….thank you!! Hi Rebecca. 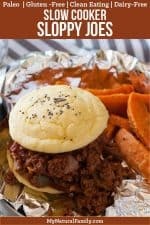 I’m making your sloppy joes tonight, and I’m wondering if I need to make the bbq sauce separately and then add it to the crockpot, or should I just put the individual ingredients for the sauce in the crockpot and cook that way? You can totally just mix it all together, nice and easy. We had the sloppy joes last night and they were DEILISH! I’ve made three of your recipes now, and loved them all. Thank you for sharing! I’m glad you like them! I make them a lot for my family, especially for parties. I think I’m going to make them for my Halloween night party so when we get back from Trick or Treating, dinner will be ready to go and my husband can eat it while he stays at home to answer the door. You mention for the BBQ sauce used with the Sloppy Joes to “Increase the lemon juice to 1 TBL”. However, when I click the link for the BBQ sauce recipe, it doesn’t have any lemon juice. So what is the correct amount of lemon juice? You also mention to “Omit the 2 spice blends from the BBQ sauce recipe, but again the BBQ sauce recipe doesn’t have any spice “blends”. I only see onion powder and smoked paprika in the sauce recipe. So do we just omit the onion powder and use the garlic powder in its place and just use less of the paprika? Thanks for clearing that up. I look forward to trying this. My daughter’s favorite meal is sloppy joes, but I haven’t made them since going paleo due to the brown sugar previously used. It really is good and easy, huh? I can’t figure out why you would need to buy a packet or use something from a can. This recipe is so good and easy and healthy! What do you mean when you say ‘blended’ for the peppers and onions. Do you actually put them in a blender (would think they turn into mush that way)? Or are they just to be finely diced? Yes. I just blend them in the blender so it’s like a sauce. You get lots of flavor and the kids don’t see chunks. They just like the flavor.